Jack Huston, star of the upcoming epic action adventure “BEN-HUR” from Paramount Pictures and Metro-Goldwyn-Mayer Pictures, will drive a 2016 Toyota Camry pace car to kick off the NASCAR Sprint Cup Series Cheez-It™ 355 at Watkins Glen International on Sunday, August 7. 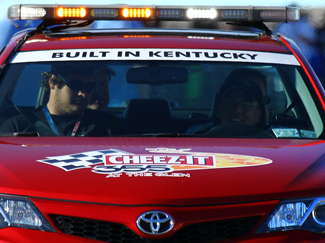 This will be Huston’s first time serving as an Official Pace Car driver at a NASCAR Sprint Cup Series event. He will also be recognized during pre-race ceremonies and will greet each NASCAR driver on stage during driver introductions. “I am excited to join NASCAR and get behind the wheel of today’s modern chariot," said Huston. “BEN-HUR” is the epic story of Judah Ben-Hur (Jack Huston), a prince falsely accused of treason by his adopted brother Messala (Toby Kebbell), an officer in the Roman army. Stripped of his title, separated from his family and the woman he loves (Nazanin Boniadi), Judah is forced into slavery. After years at sea, Judah returns to his homeland to seek revenge, but finds redemption. Based on Lew Wallace’s timeless novel, Ben-Hur: A Tale of the Christ. The film also stars Rodrigo Santoro, Nazanin Boniadi, Ayelet Zurer, Pilou Asbaek, Sofia Black D’Elia and Morgan Freeman. Timur Bekmambetov directed the film from a screenplay by Keith Clarke and John Ridley. Sean Daniel, Joni Levin, and Duncan Henderson served as producers, with Mark Burnett, Roma Downey, Keith Clarke, John Ridley, and Jason F. Brown serving as executive producers. “BEN-HUR” will be released in theaters on August 19, 2016. Huston previously starred for four seasons in HBO’s hit series, Boardwalk Empire, as the sniper with the horribly disfigured face, ‘Richard Harrow’. In 2013, Huston appeared in the critically acclaimed and award-winning film American Hustle, where he played mobster ‘Pete Musane’. Additionally, he starred as ‘Young Ira’ in George Tillman Jr.’s film adaption of the Nicholas Sparks novel, The Longest Ride. The NASCAR Sprint Cup Series returns to Watkins Glen International August 4-7 for the Cheez-It™ 355 race weekend, which also features the NASCAR K&N Pro Series East Bully Hill Vineyards 100, and the NASCAR XFINITY Series Zippo 200 at The Glen. Tickets for all of the action are available by calling 1-866-461-RACE or by logging on to www.theglen.com.